Memory Quilts and Scrap Books! It is hard to believe that 2013 has come and gone! Now that January is here, I am sure many of you are trying to organize and clean out some of the items you no longer use in your home. How many of you have a drawer full of t-shirts that have literally been stashed in that drawer for quite some time? These shirts represent a memory of a time/place/or person, and you can't bear to part with them. Why not have a Memory Quilt made with them? Think of it as the modern form of scrap booking-except I do all the work ;) Memory Quilts are scrapbooks made of fabric! They preserve your memories in a beautiful way BUT a scrapbook gets put away on a shelf, a Memory Quilt can be wrapped around you every day! 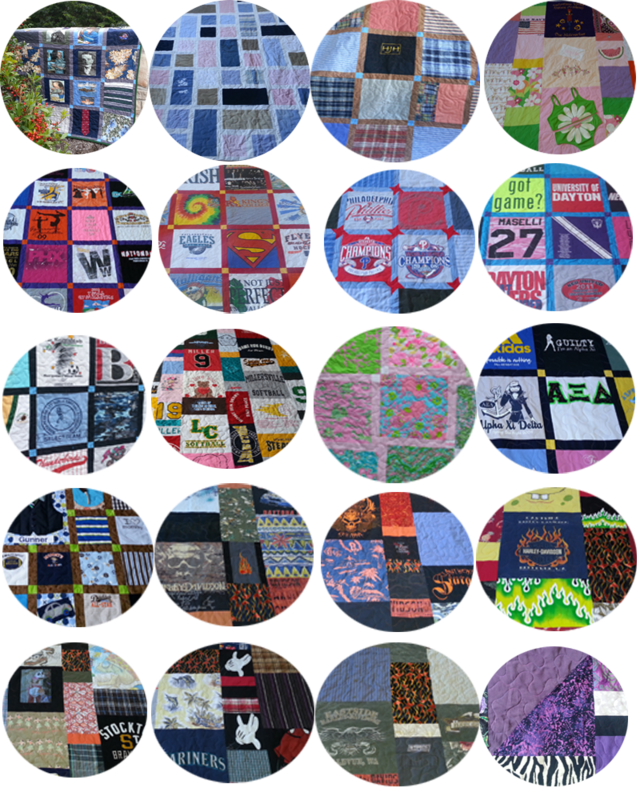 As always, if you are interested in a Memory Quilt please contact me ASAP so that I can add you to the list! It was a very difficult choice this month! There were some amazing quilts made. 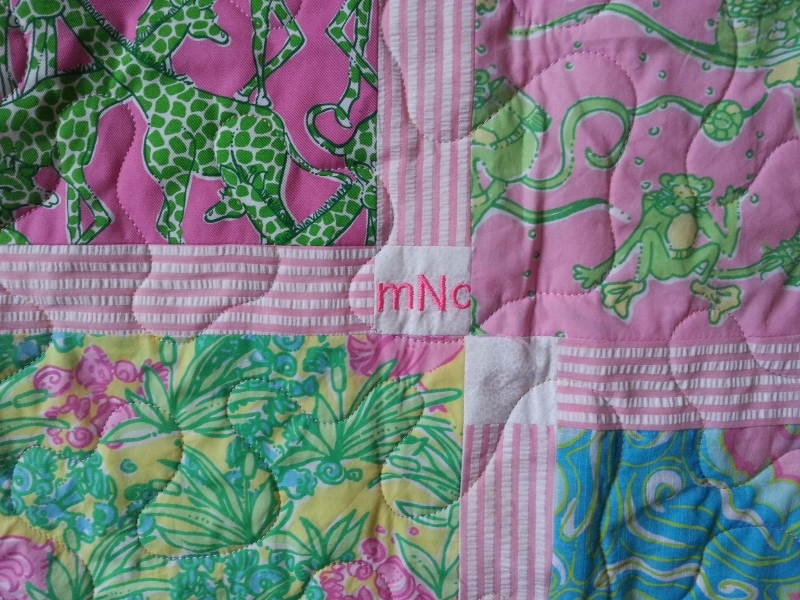 But, I chose the Lilly quilt because it is so unique! 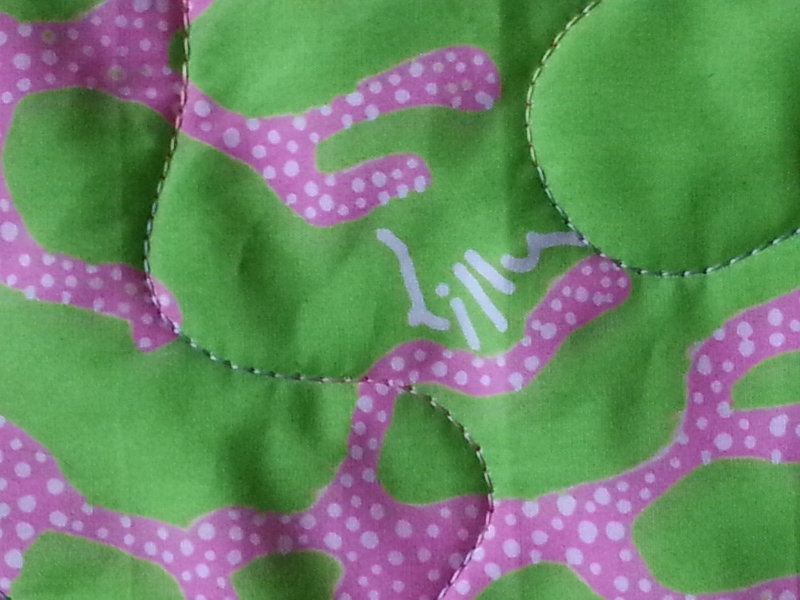 The entire quilt is made with Lilly fabric. It was made in the new staggered style and was sashed with classic gingham fabric, hot pink initials were added to make it extra personal, and it was backed with a gorgeous pink polka dot flannel. 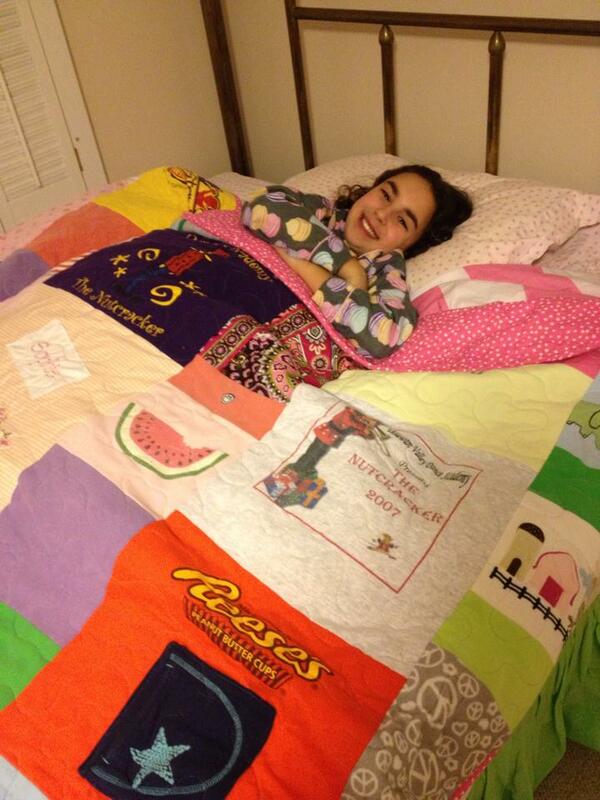 Receiving pictures of such happy customers wrapped in their quilts shortly after Christmas was wonderful! Their smiles say it all! 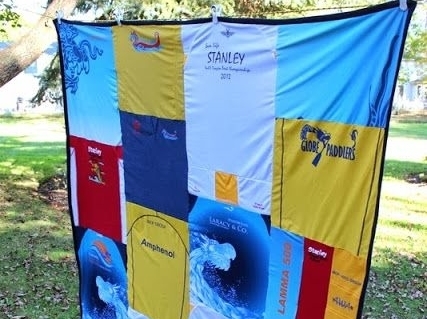 Whether the quilt tells a sweet story of the love of ballet dancing and Reeses peanut butter cups, or if the quilt is a special remembrance of a loved one that left us far too soon, each quilt was designed to warm your hearts and your bodies with cherished memories. May you all find comfort in your Memory Quilts! 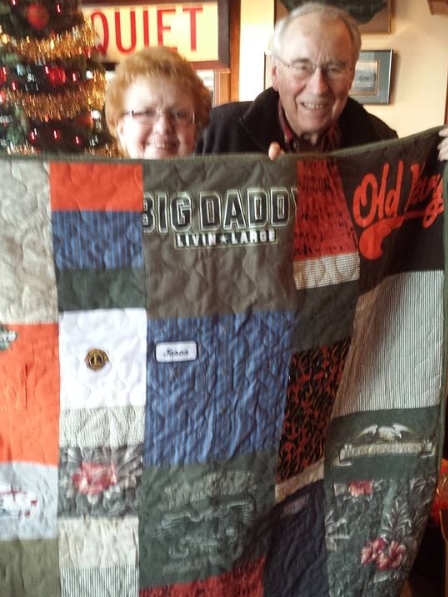 Thank you for letting me create your custom Memory Quilts! 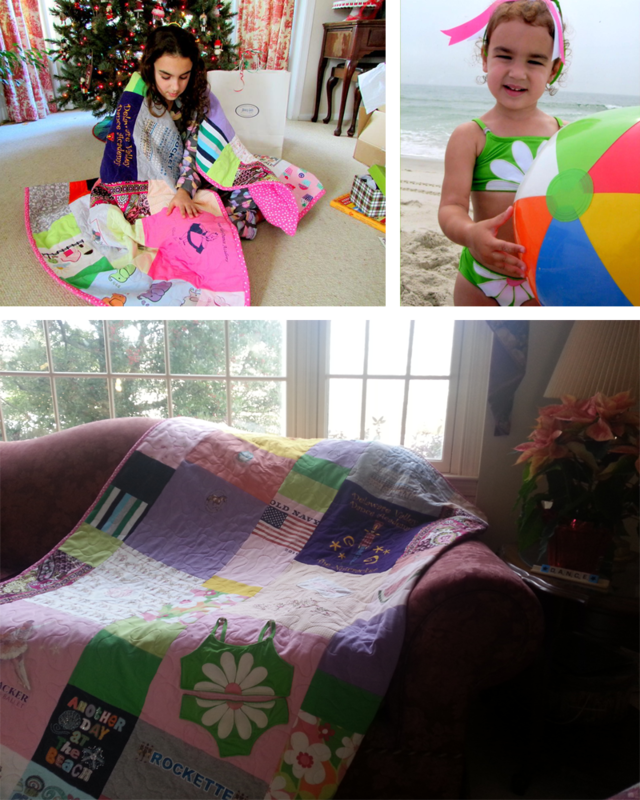 The quilt below is a Modern style lap quilt with all kinds of Gymboree clothing-even a bathing suit. 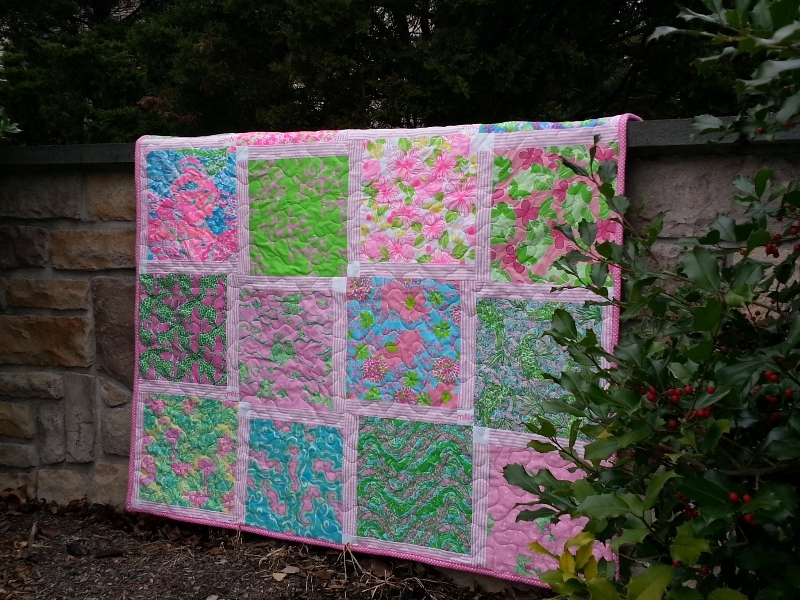 Sophie said that her Memory Quilt was the best present under the tree! It is amazing how much she has grown. The picture on the left is Sophie this past Christmas morning and the picture on the right is her in her sassy swim suit a few years ago;) Careful, you blink your eyes and they grow up! When shopping for a Memory Quilt it is important to understand the difference between a handmade quilt and a blanket. Many companies offer Memory blankets at a much lower price. It is because these blankets are not quilted using a state of the art long arm quilting machine. The quilt I made below has been expertly long arm quilted ensuring that the top quilt, batting, and backing stay in place. Long arm quilting takes time, but is done in a beautiful meander or swirl stitch with the highest quality, variegated thread. This process turns a flimsy blanket into an authentic QUILT just like the one seen below. This Memory Blanket shown on the right was made by someone else. It was not long arm quilted and therefore cannot be considered a quilt, it is a blanket. It is important to know the difference when shopping for your handmade Memory Quilt. 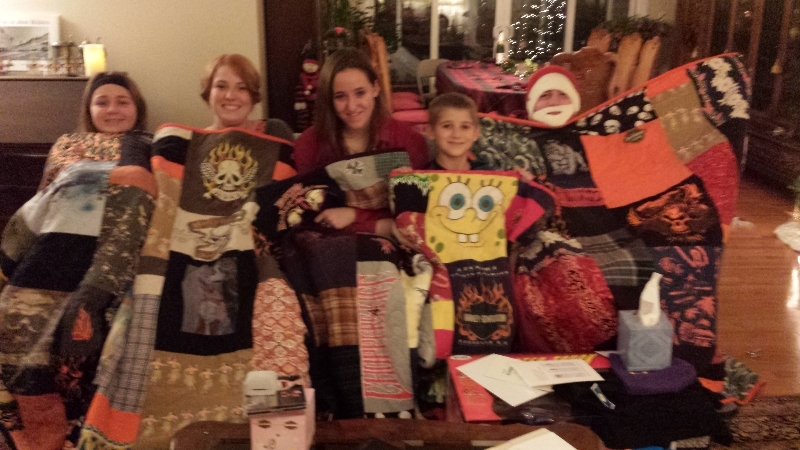 Memory Quilts were made this holiday season! Yes, it is that time! Graduation quilts are now being ordered! I already have 5 grad quilts on my schedule. If you are interested in a grad quilt for May or June NOW is the time to order. Please remember that these quilts take a very long time to make AND turning people away is no fun! Copyright © 2014 Memory Quilts by Molly, All rights reserved. Your are receiving this email because you have shown interest in Memory Quilts.